Brighter provides support for a distributed task queue. Instead of handling a command or event, synchronously and in-process, work can be dispatched to a distributed task queue to be handled asynchronously and out-of-process. The trade-off here is between the cost of distribution (see The Fallacies of Distributed Computing) against performance. A problem with the TPL approach is that your operation can only meet the 100ms threshold if your work can be parallelised such that no sub-task takes longer than 100ms. Your speed is always constrained by the slowest operation that you need to parallelize. If you are I/O bound on a resource experiencing contention beyond 100ms, you will not meet your goal by introducing more threads. Your minimum time is your minimum time. You might try to fix this by acking (acknowledging) the request, and completing the work asynchronously. This option is particularly attractive if the work is I/O bound as you can process other requests whilst you wait for the I/O to complete. The downside of the async approach is that you risk that the work will be lost if the server fails prior to completion of the work, or the app simply recycles. These requirements tend to push you in the direction of Guaranteed Delivery to ensure that work you ack will eventually be handled. A distributed task queue allows you offload work to another process, to be handled asynchronously (once you push the work onto the queue, you don’t wait) and in parallel (you can use other cores to process the work). It also allows you to ensure delivery of the message, eventually (the queue will hold the work until a consumer is available to read it). In addition use of a distributed task queue allows you to throttle requests - you can hand work off from the web server to a queue that only needs to consume at the rate you have resources to support. This allows you to scale to meet unexpected demand, at the price of eventual consistency. Brighter implements Task Queues using a Message Broker. The producer sends a Command or Event to a Message Broker using CommandProcessor.Post(). When we deserialize we set the MessageHeader which includes a topic (often we use a namespaced name for the Command or Event). We store the created Message in a Message Store for use by CommandProcessor.Repost() if we need to resend a failed message. The Message Broker manages a Recipient List of subscribers to a topic. 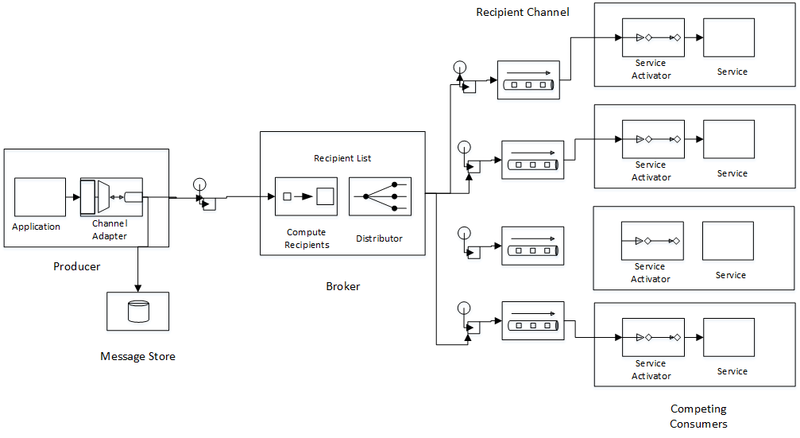 When it receives a Message the Broker looks at the topic in the MessageHeader and dispatches the Message to the Recipient Channels identified by the Recipient List. The consumer registers a Recipient Channel to receive messages on a given topic. In other words when the consumer’s registered topic matches the producer’s topic, the broker dispatches the message to the consumer when it receives it from the producer. A Message may be delivered to multiple Consumers, all of whom get their own copy. in addition, we can support a Competing Consumers approach by having multiple consumers read from the same Channel to allow us to scale out to meet load. Brighter removes some complexity from its implementation by relying on the Message Broker to provide a number of services. First the Broker provides message routing. The producer does not need to have any idea where the consumers are located, only where the broker is located. This makes it easy to relocate your consumers, and when then begin subscribing the Broker will figure out how to deliver to them. It also supports a recipient list when routing messages: one producer can send to many consumers. Second we rely on the Broker to provide a clustered High Availability (HA) solution to queueing. We want to be able to send a message to the Broker cluster and rely on the Broker to deliver it, eventually. Without a Broker, using a point-to-point solution we have to provide a lot of this infrastructure ourselves, such as routing and distribution and how to do so in a way that is HA. For this reason we don’t support a point-to-point approach like MSMQ or sending directly to a service via HTTP. (We do have an experimental implementation of an HTTP-based broker using the RESTMS specification but it is not production-grade, and only in-memory as of today). A consumer reads the Message using the Service Activator pattern to map between an Event Driven Consumer and a Handler. The use of the Service Activator pattern means the complexity of the distributed task queue is hidden from you. You just write a handler as normal, but call it via post and create a message mapper, the result is that your command is handled reliably, asynchronously, and in parallel with little cognitive overhead. It just works! You add a message mapper to tell Brighter how to serialize the message for sending to your consumers. One option is to use a Core assembly that contains your domain model, handlers, message mappers etc. and then pull that assembly into endpoints that consume such as services and web endpoints. This makes it easy to move between in-process and out-of-process versions of the handler. It also means you don’t end up writing two versions of the mapper one on the consumer side and one on the sender side. The Tasks Example uses this strategy. This model only works if your library is shared between components that operate on the same bounded context i.e. Continuous Integration that are released together. Never share such an assembly between projects that should be released autonomously as it is a shared dependency. In that case you **must** implement the mapper on both sides. Then you write a handler as normal. To ensure that messages reach the handlers from the queue you have to use the Dispatcher. The Dispatcher reads messages of input channels. Internally it creates a message pump for each channel, and allocates a thread to run that message pump. The pump consumes messages from the channel, using the Message Mapper to translate them into a Message and from there a Command or Event. It then dispatches those to handlers (using the Brighter Command Processor). To use the Dispatcher you need to host it in a consumer application. Usually a console application or Windows Service is appropriate. We recommend using Topshelf to host your consumers. The following code shows an example of using the Dispatcher from Topshelf. The key methods are Dispatcher.Receive() to start the message pumps and Dispatcher.End() to shut them. We do allow you to start and stop individual channels, but this is an advanced feature for operating the services. So how do we route messages from the channel to the handler? The answer is the framework uses configuration that your provide to do that. Configuration is the subject of this documentation here.